REY is a personal wearable companion that uses artificial intelligence to translate visual information into sound and touch. The device is worn on the head and offers a hands-free experience for users with various needs. For persons with visual impairments, REY provides a way to navigate, sense and identify objects through touch and multidirectional sound. For sighted users, REY provides a way to operate a smartphone or other device hands-free. 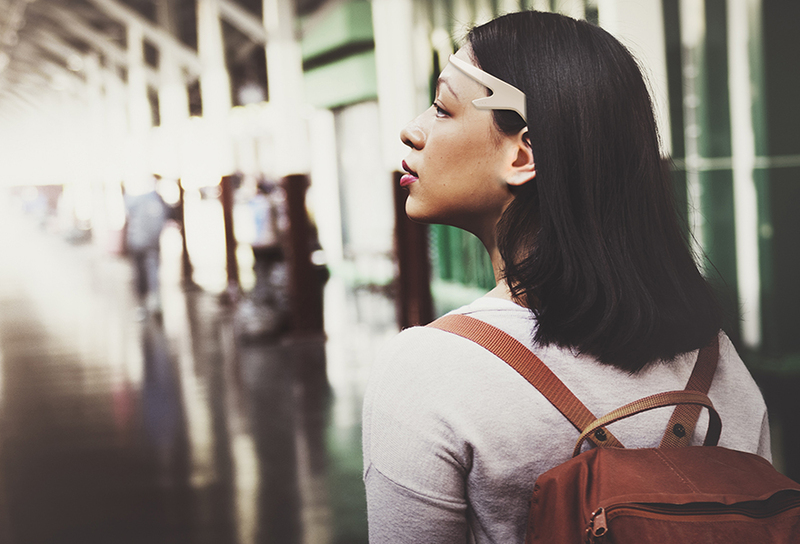 By augmenting the senses, REY applies technology to deepen human experience. Clara Fessler is an ambitious designer who uses design research to explore potentials of designs in early concepting stage. Besides the key importance of gaining knowledge from users and involved stakeholders, she believes in the high impact of co-creation to build truly meaningful products and experiences. While studying Industrial Design at the FH JOANNEUM and during her internships she could develop and apply skills in various product design & interaction design projects. Curiosity – which is a main trait of her personality – has guided her explore different (design) fields. This is also reflected in the tools she uses in her projects, ranging from design thinking to empathic modeling, co-creation, (electronic) prototyping, interaction design and VR explorations.